Golden State team-mates Kevin Durant and Jonas Jerebko combined for a breakaway dunk in the Warriors' 131-121 win over the New Orleans Pelicans. The duo showcased the Warriors' trademark team-work with 3:43 remaining in the third quarter as Jerebko was first to react as Pelicans' point guard bobbled a loose pass. 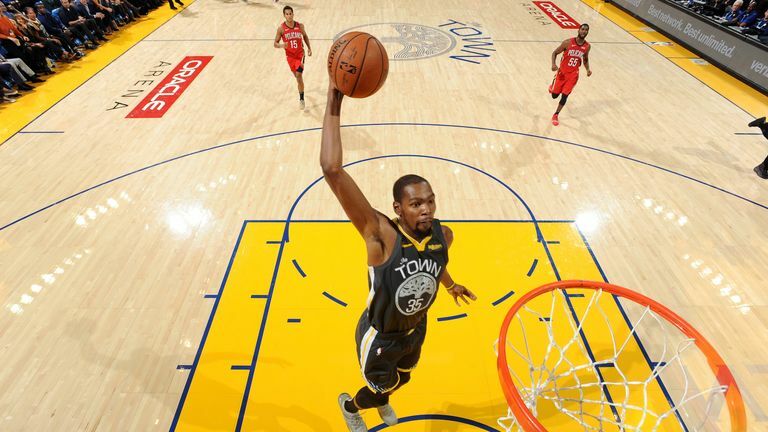 The Golden State forward seized possession and instantly whipped a behind-the-back pass upcourt to a waiting Durant who, with no Pelicans defenders near him, cruised towards the basket before unleashing a vicious one-handed dunk. Click on the video at the top of the page to view Durant's dunk along with nine more top plays from Wednesday night's NBA action. On Saturday November 10, you will be able to follow the Milwaukee Bucks @ Los Angeles Clippers, also available on a free live stream, from 8:30pm on skysports.com and the Sky Sports app.